The Flag of the United States of America features thirteen equal horizontal stripes of red alternating with white. The blue rectangle in the upper hoist-side corner bears fifty white stars representing the 50 states which make up the United States of America. The stripes represent the 13 original colonies which gained independence from Britain. The design and colors of the US flag are similar to a number of other flags, including those of Liberia, Malaysia, Puerto Rico and Chile. The first American flag came into being thanks to the need of having a national symbol as a result of the independence of the thirteen colonies from Britain. The flag of the United States is variously known as the Stars and Stripes, Old Glory, and the Star-Spangled Banner. The most famous of the nicknames is Old Glory. Who made the first US flag and when? That who made the first US flag is in the realm of debate. However legend has it that Betsy Ross, a seamstress of Philadelphia, was the first to create the flag. According to another school of thought, New Jersey Congressman Francis Hopkinson was responsible for designing the flag. 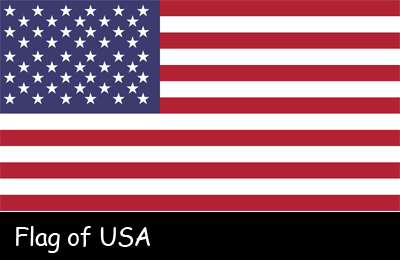 Since its first inception, the national flag of the USA has undergone several changes. On June 14 (now celebrated as “Flag Day”), 1777, the Continental Congress passed the first Flag Act, which resulted in the establishment of a new flag for America. The act stated said that the flag would be made up of thirteen white stars on a blue box on a background in which thirteen red and white stripes alternate. In 1949 June 14 was officially declared Flag Day by the then American President Harry S. Truman. With the entry of new states into the union, the US Congress decided that there should have one star for each state. Between 1777 and 1960 the US Congress passed several acts that changed the design of the flag and allowed stars to be added to represent the entry of each new state. The design has been modified to reflect these changes and the current flag comprising 50 stars 50 stars and 13 stripes has been in use since 1960 when Hawaii joined the union. The colors of the US flag are also symbolic. Red symbolizes bravery, valour and zeal; white purity and innocence; blue loyalty, devotion, vigilance, perseverance and justice. Display of the US flag is generally from sunrise to sunset. It should be pulled to the top briskly and lowered ceremoniously.When two or more flags are flown from the same pole, the US flag must be on top. The flag, when flown at half-staff, should be raised to the peak for a moment and then lowered to the half-staff position. The flag should be again pulled to the top before it is lowered for the day. The flag of the United States of America should be displayed daily on or near the main administration buildings of all public institutions and in or near every schoolhouse during school days.